LITOZIN® consist of rosehip powder from the wild rose Rosa Canina L. LITOZIN® powder is free from any additives or artificial colourings, and is therefore a purely natural dietary supplement. What is the content of LITOZIN® and when is it best to take your daily dose? Here you will find answers to the most common questions about Litozin. Exercise strengthens muscles and joints in the body. Get tips and exercises that help maintain flexible and healthy joints. Use rosehip powder as a natural flavour in food. Here you can find easy and delicious recipes with rosehip. Litozin powder contains rosehip from the wild rosehip species called Rosa Canina L. The product is 100% pure and is a completely natural dietary supplement. Litozin powder is produced from wild growing rosehip berries, where the seeds are removed and the shell is ground to a concentrated rosehip powder. Rosehip powder is a natural product classified as a dietary supplement. Rosehips help to maintain healthy and flexible joints. 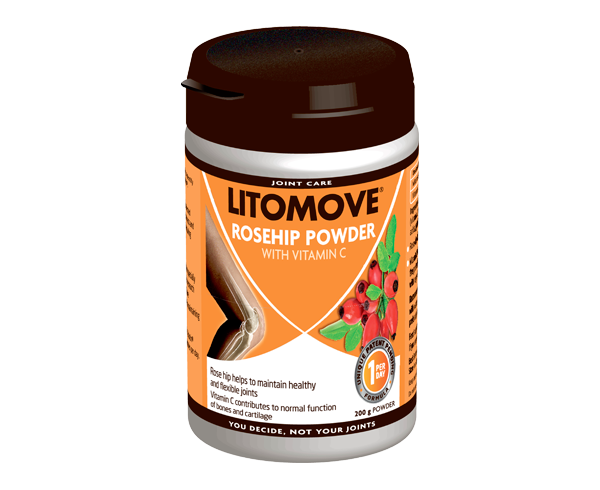 Litozin powders and capsules consist of rosehip powder from the wild rosehips of the Rosa Canina L species. This rosehip grows wild in southern Chile – grown as nature intended. The berries are handpicked, harvested, and gently processed to conserve the rosehip’s beneficial qualities. The final manufacturing of the powder takes place in a specialized patent-pending production unit in Sweden. Rosehips helps to maintain healthy and flexible joints. Vitamin C contributes to normal collagen formation for the normal cartilage and bone function. Litozin comes in three different formats to suit your lifestyle: capsules, tablets or powder. For example, you may prefer to mix rosehip powder with your morning muesli or porridge, so choose the powder, which comes with a handy measuring cup. You can also mix rosehip powder with juice or smoothies; the powder is easier to mix into thicker drinks. Choose what suits you, and what you think tastes the best. However, avoid heating up the powder to more than 40 degrees, as vitamin C breaks down when heated. For further inspiration and ideas, check out our recipes. If you find it more convenient to take rosehip capsules or tablets, your best choice would be Litozin rosehip capsules (3 per day) or rosehip tablets with collagen or glucosamine (1 per day). 1 measured dosage daily (2.5 g). The powder may be mixed with water or juice, sprinkled on yogurt, kefir, and smoothies and so on. Rosehip powder should not be heated. Litozin – now newly developed into a seedless product and thereby halving the daily dosage. The result: a product where the daily dosage has been halved from 5 g to 2.5 g per day with the same beneficial results. The recommended daily dosage should not be exceeded. Food supplements should not be used as an alternative to a varied diet. It is important to have a varied and balanced diet, and a healthy lifestyle. Store at room temperature and out of reach of small children. Wild rosehip powder (Rosa Canina L). Dietary Supplement. Net weight 200 g of powder.